DaanCalendar is a small, fast and simple program that will let you insert events for each day of a month. Publish the calendar to a webpage and an active reminder are some of it's features. You'll never miss another appointment! · Very small & fast (only 325KB executable!). · Sits quietly in you systemtray. · View in browser using a selectable XSL stylesheet. · Save and read CSV (Comma separated files). · Simple exporting to Excel. · Simple active reminder system. · Insert events for as many months and years as you wish (only registered users). · You can use your mousewheel to change months. 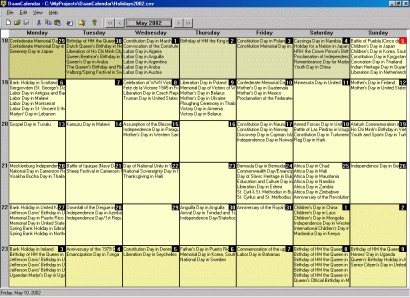 · Includes an example calendar with holidays from all over the world. DaanCalendar.exe (192 KB) 7.Nov.2015 - DaanCalendar build 2.0 installation package for Windows Vista/7/8/10. Since version 2.0 DaanCalendar is freeware.